Welcome to Stop 29 and Chapter 29 of the CONSEQUENCES audioBOOK blogTOUR! If you’re in a hurry to listen to Chapter 29: BITTERSWEET COFFEE, hurry over to THE GENRE MINX BOOK REVIEWS RIGHT NOW! Me: Run run to THE GENRE MINX BOOK REVIEWS to find out! But if you’re still here, then please meet another of the amazing people hosting the Consequences Audio Tour! 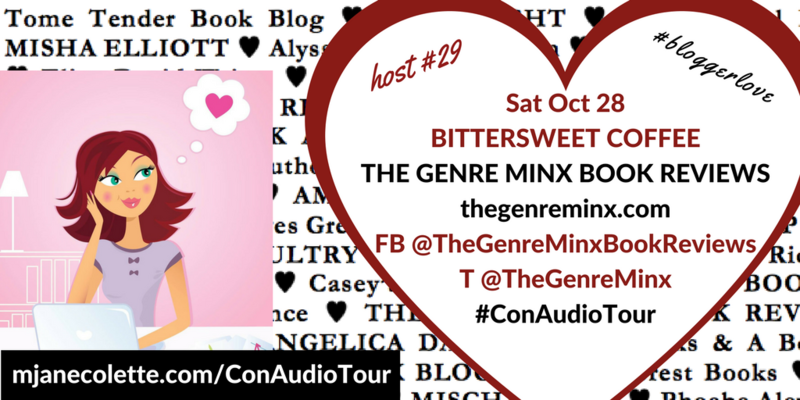 Stop 29 (and Chapter 29) is hosted by Amy at The Genre Minx Book Reviews—a blog where reading is the key element to happiness. The Minx and I (she does have a real name, and I do know it, but she’s forever going to be the Minx in my head and heart) met on Amanda Siegrist’s Christmas in July hop (did I mention to you how much fun it was?—and the Minx was part of the reason why). I am so happy the Genre Minx Book Reviews blog is part the Consequences Audio Tour, and I hope her readers enjoy the BITTERSWEET COFFEE chapter, which is a huge turning point in the story! Thank you, The Genre Minx Book Reviews​! Now, get thee to their blog, and listen to Chapter 29: BITTERSWEET COFFEE.